Most engines incorporate three stages of filtration—a screen at the tank and paper-element primary and secondary filters. Filters are rated by the size of particle trapped: a typical installation would employ a 30-micron primary filter and a secondary of between 10 and 2 microns. 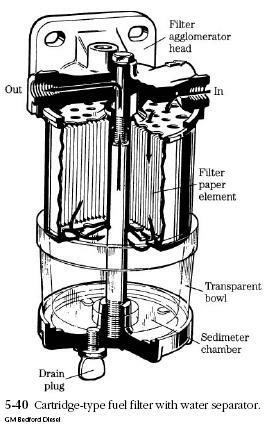 A water separator is often built into the primary filter (Fig. 5-40), which also may include a connection for fuel return and an electric heater to prevent fuel gelling and waxing in cold climates.